You know those kids songs that get stuck into your head? The Duck Song is totally one of those tunes. If you click on the link, you will also see it’s a highly amusing You Tube clip that has become a You Tube sensation despite the simplicity of its quirky graphics. Well, I think it’s amusing, I’m sure there are some that may disagree. My sister-in-law first introduced it to me during the 2012 Christmas holidays. She was incredulous that I didn’t know of the existence of The Duck Song before that. When I saw that even my less then tech savvy father had The Duck Song on his iPad, I concluded that indeed, the whole world must know about The Duck Song. When looking through the books to review from Scholastic, I was excited to see that The Duck Song has now been made into a book! I’m not sure why it excited me, maybe because I have a firm opinion that books are always better than the film. Although, admittedly, in this particular case, it’s a bit hard for a book to be as brilliant as the You Tube Clip. However, it is a bit of fun to have it as a book as well. The book comes with a CD so we instantly played it. The triplets have a fondness for ducks, thanks to their rubber duckies, so they loved pointing to a duck every page! My kids aren’t the types to go around singing songs repeatedly, so beware if your kids are the type. It is a ditty that is easy to sing over and over and over again. I know, because I was singing it over and over and over again for the rest of the day and my kids were begging me to stop it. Ah, the fun of being an immature adult! It did turn out to be a useful teaching tool too. I had discovered, (thanks to cousins that go to the same school as Jonty and dob on him) that Jonty has been a bit silly and annoying to other kids during lunchtimes. We were able to talk about why the duck didn’t do anything wrong, but he was being annoying. We also talked about when people are annoying back to us, it’s better to be compassionate like the man was in the end rather than being mean to others. So, are you familiar with The Duck Song? Christmas books are an excellent opportunity to engage children in literacy and build the expectation and anticipation of Christmas. We have been enjoying several books this Christmas. I thought I might share some with you. You would not believe how much my children LOVE this book. I have mentioned before that they enjoy joke books, and this book is pretty well top of the Christmas hits for them! I have read it to them over and over again. (And over, and over….) Thankful Jonty is now starting to read the jokes himself, seeing my reluctant reader open up books and read it by himself, always does my heart good. Q. What do monkeys sing at Christmas time? I hope the recipient was able to read the yellow texta! This morning the boys had some friends around, the boys started off the morning with the Christmas Crackers. “Where’s Santa” is also a big hit in our house. 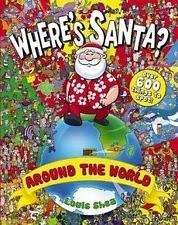 We already had a copy of Where’s Santa from Scholastic book club several years ago. It always gets re-examined at Christmas time. It was very exciting when a Scholastic box arrived in our mailbox with a new “Where’s Santa” by Louis Shea, particularly since this was an “Around the World” edition. Jonty is very interested with all things from other countries, so this was right on his interest level. It’s basically like a “Where’s Wally”, only you are looking for the rosy cheeked fat guy! Recently Uncle Greg came over to babysit. The triplets were already in bed, so it was a pretty easy gig for him. (Especially when our usual escape-artist from the trio emerged from the room, and got such a fright seeing Uncle Greg, he howled and needed a lot of consolation, and then stayed in his bed the rest of the night. The big boys needed a story read to them before going to bed. The “Where’s Santa books were perfect. Uncle Greg is dyslexic and dreads reading aloud, so he was more than happy to avoid lots of words. 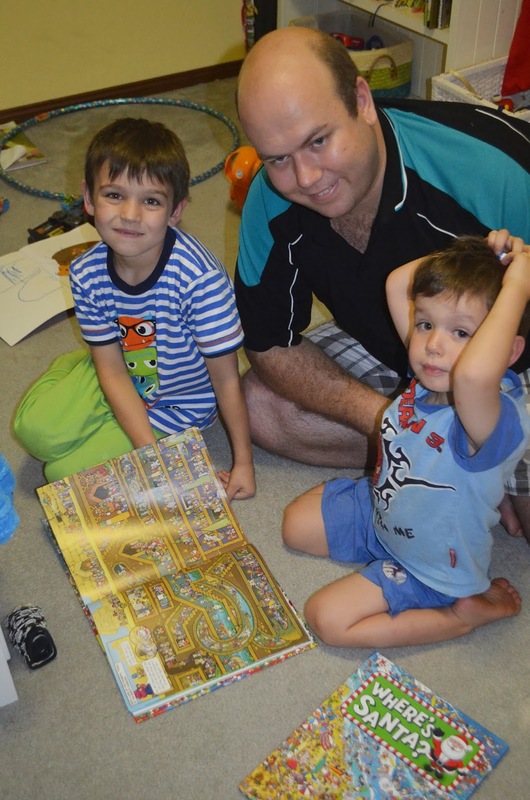 In the true style of indulgence that an uncle or aunty does, I think the boys got to examine a lot more pictures in the book than if Mummy was reading. Mind you, Mummy tires of searching for small creatures fairly easily. Daddy is also more patient than Mummy. I don’t know what it is about the Where Is or Find it books and boys. When I was teaching, I noticed they were always popular with the boys on library days. I know girls like them too, but from my observation, boys are particularly enthusiastic to find things! Jonty has been getting his eyes checked recently. He doesn’t need prescription glasses at this stage, but it has been recommended he do some eye strengthening exercises. In the list of activities the optometrist gave me, The “Find It” books were listed under Visual Analysis/Visualisation. (To help visual matching, memory and thinking skills.) Check! Do your children enjoy “Find It” or joke books? Have you got a good Christmas joke that I can pass onto Jonty? I have a wonderful bookclub. Reading and discussing books is a great joy of mine. The group of ladies who I do this with on a monthly basis are one of the great delights of my life. We are a mixed bunch. All from our regional town, some of us know each other very well, some of us have met through this group. Despite the fact that we may see some of our fellow readers in very few alternate contexts, we all have intersecting worlds and every meeting we discover someone has a friend outside the group that someone inside the group knows. It’s like that living in a small community. About twice a year we put forward suggestions of some books we would like to read. From those suggestions there is a discussion on which of those suggestions most appeal to the group. Then we put a list together outlining the chosen books for several months in advance. We have read novels and biographies, fact and fiction. There are always books on the list that I would never normally pick up. Sometimes it is for good reason, other times I am ever so glad for the enforced read. It is also agreed that whoever chose the book for that month supplies something to eat. If we can connect the food into something within the group – all the better. We have have come together through our common love of books. We don’t all enjoy the same thing, we don’t all agree with each others interpretation of the book. We do find joy in the discussion, which often is far more encompassing than just the content of one book. We have developed friendships which are cherished and enjoyed, tied together by characters constructed by an author’s prose, simple written text. Yet during the month those character enter into our individual minds. Shuffling, dancing, plodding and spinning through our imaginations. As we all assemble and chat around the table, the characters come to life, jumping from head to head as we talk, and as they do our understanding becomes a little deeper of those characters and the women sitting and talking, explaining, sharing. We don’t all read the book. Every month there will be someone(s) who has not finished, in fact it is not uncommon to have participants who have not yet opened to the first page. It does not matter. The talk can continue, our minds can be stimulated regardless. Conversation can be contributed to regardless. It is such acceptance of one another’s busy lives that helps the group to succeed. Considering the age of the children we mother – mostly in the under 8’s set – I very well think we could discuss that book, although more about the show it represents then the actual content of the book. In fact, I think it may have already come up in discussion before – right alongside Peppa Pig. Do you enjoy reading? Are you a member, or have you been a member of a book club? What was the protocol of your group? Something I have always been passionate about is writing and literacy. Therefore, I have always made it a priority to read with my children. I always start when they are babies. My babies were all very active, so I have even crawled around after them reading a book and shoving the book under their nose to look at the new illustration in between playing! I found once they were over 12 months old, it got even more fun reading to them because the children had a little more of an attention span and tend to interact even more with the books. 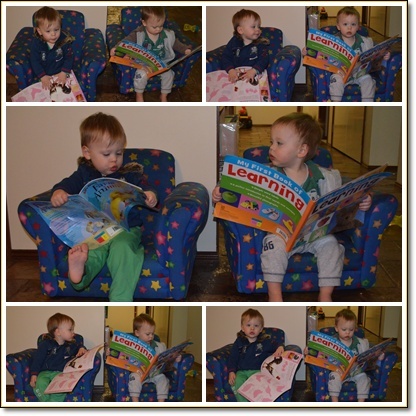 I have three one year olds at the moment and we have been enjoying reading, I thought I would share some of my top tips and book selection for reading within the 12-24 month age group. A lot of this advice can also be applied to babies younger than 12 months also. 1. Read With Animation and Expression. You might revel in the drama or feel like a goose, but pretend you are an amateur actor as you are reading and use lots of animation and expression in your voice. If you aren’t used to reading like this, do it while no one else is around, and gauge how your child is so much more engaged with the story. You don’t necessarily have to do ‘voices’, sometimes I will to have a little fun, but sometimes I couldn’t be bothered, but I always read with expression. When I was at uni, a lecturer told us that Early Childhood educators should take particular note of how stories are read on Playschool. It’s true. If you read stories dramatically, pausing to create suspense or talking quickly to build momentum, the children will find it much more enjoyable. And importantly, when they start to read themselves, there’s a high likelihood that they will also use expression rather than the beginner reader drone. 2. Choose Books Appropriate For Their Age Group. One board book that has been a recent favourite in our house is Possum Magic, Animals based on Julie Vivas’s illustrated animals in Mem Fox’s Possum Magic. Having very tactile children, I didn’t think this book would be such a hit, but it absolutely was, by every one year old in the house! They have read it over and over, and as you can see in the picture below, have examined the bright whimsical pictures in great detail. This is a Scholastic book. It’s released this month at the RRP of $9.95. The triplet’s and I give it a big thumbs up! If your children are very active like mine, the touch and feel books will have immediate appeal. It gives the child the opportunity to have tactile stimulation while they listen. We have a wide selection of board books. The “That’s Not My…” series is excellent. 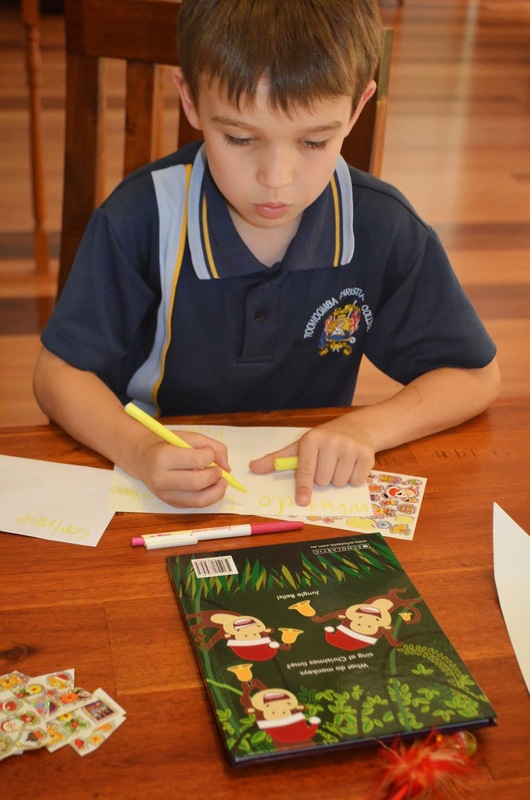 The story moves quickly aqnd it is repetitive, a key formula for success in early childhood literacy, and there’s plenty to touch and explore. The baby touch series is also wonderful. We have a few book featuring nursery rhymes. Nursery rhymes are great for developing literacy in children. 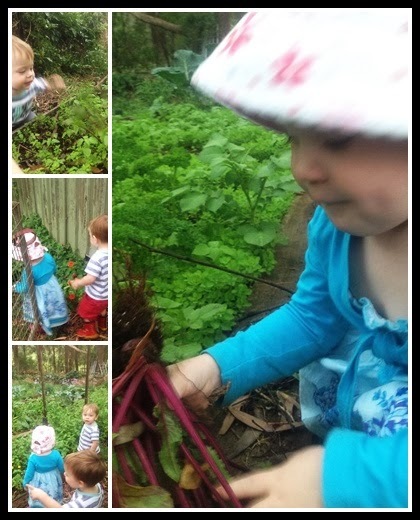 They hold the child’s interest and the repetition and rhyming words are super for developing an awareness of words and flow. As I pointed out in my post about Mem Fox’s book, Good Night, Sleep Tight, children who learn at least six nursery rhymes by the age of four will normally be in the top reading group by the age of 8. We also have some board books with simplified versions of fairy tales. (See three little pigs below) This is a great introductory way to introduce children to these well loved classics. The Book Depository has a great selection of touch and feel fairy tales. See here. 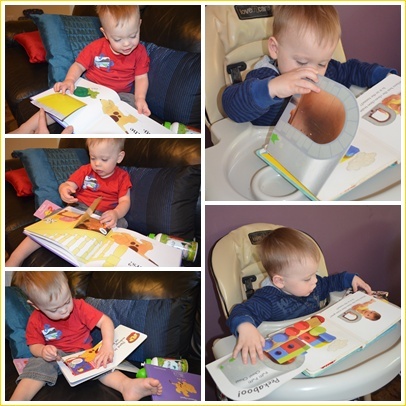 Toby enjoying touch and feel books. 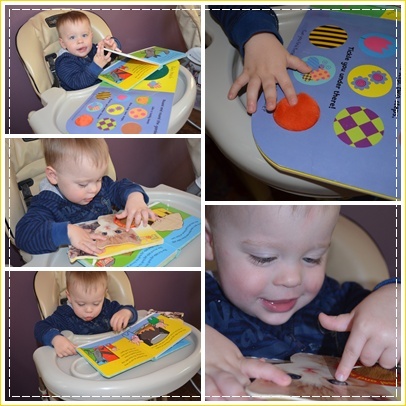 Toby is the most active of the triplets, so touch and feel books are his favourite as he needs to do something with his hands and only has a short attention span. Another good book selection is lift the flap books. The “Spot” (The Dog) books are great examples. I would recommend these books once your child is over 18 months, because even when made of sturdy paper, they do have a tendency to tear. Even the board book lift the flap books have cardboard flaps, so I normally reserve these books as books to be read with an adult. That way you can teach them how lift them gently and carefully and how to put them back down before turning the page. Jayden reading the Spot books. Toby reading a lift the flap board book from the “Peekaboo” series. (I bought them at a Learning Ladder party.) These book has been a favourite or all five kids. I’m not entirely sure what to call these books, but they are plentiful. These are the books that have a whole heap of photos with words next to them. When I first had kids I thought they were a bit pointless and boring. The reality is the kids love them and it is EXCELLENT for language development. You can get them on all manner of topics – fruit, body, babies, farms, animals, etc. My kids have a very battered and bruised one on farms (it’s also a flap book) that has been much loved. In the picture below Jayden is holding the current favourite. We have three in this series. (I got them cheap at QBD) Unfortunately they all tend to like the book with the picture of a tractor on it. So there are fisty cuffs in the pursuit of this book. There’s another book with some pictures of motorbikes which also catches Jayden’s interest. He is mad about motorbikes right now. Books with pages with fruit on it are always popular and pictures of babies. Don’t they look like two little old men? You can tell that Jayden has a better attention span then Toby! I can see them in their armchairs reading the papers together when they are 50! Don’t feel you should only read board books to your toddler. There are plenty of books that are short enough to maintain a small child’s interest. And if you are holding the book while you are read, it normally remains safe. Imogen reading the end of “My Dinosaur Dad”. The illustrations are so bright and vivid. The kids love examining it. The pages are actually quite thick card, so now that the triplets are getting close to being two (Yikes!) I’m happy for them to start learning to turn paper pages with a book like this. It’s a good springboard for discussing what makes the child’s Dad special. The perfect book prior to Father’s Day. Trent and Jonty also loved this one, so they came up with their own words for Daddy – scratchy, fast, normal sized and cuddly. The book was released by Scholastic NZ. It’s RRP is $15.99 and the publication date is Aug. 2013. Wow – what HUGE dinosaurs! Now I’m going to contradict what I have said above! Yes, it’s so important to choose age appropriate books. However, don’t let that stop you! If you are reading a longer story with more complex themes to your older children and your 1 year old wanders over. Join the toddler in! You don’t want your younger child to think they are excluded from some reading experiences. If they lose interest, don’t press the issue too much since it’s advanced literature for a toddler. Sometimes, it’s got nothing to do with the literacy. Sometimes children just love the emotional security of hearing a grown-up read. Also, your 1 year old is probably going to be read longer stories in playgroup or other settings, so it’s good practice for them. Miss Rachael with Trent, Toby and Immy reading a childhood classic, “The Hungry Caterpillar” by Eric Carle. I hope this gives you some inspiration for reading with your babies and toddlers – especially your one year olds! Reading is such an important skill, and reading aloud can help your child learn to read years before they learn any letters! ** I have not been paid for this post. I was sent “My Dinosaur Dad” and “Possum Magic Animals” from Scholastic, but was under no obligation to write about them, but did so because they are awesome. All opinions are my own. More precisely, a super-duper, yummy tummy chocolate chip cookie. Oh my. I don’t believe in spoilers. But there you are. You now know the answer to the title of the book. Don’t be disappointed, you’ll still enjoy the story if you ever read it to your kids. And I highly advise that you do. Such a delightful little tale with totally bewitching illustrations. I got so caught up examining them that Trent was finished and begging me to turn the page. The lovely people at Scholastic have been surprising me by sending me boxes of books. It has been totally, completely, utterly divine for the this little book lover. I thought it would be nice to share some favourites, because who knows, if they pop up when you are browsing a book club catalogue or see a title on the shelf, it’s always nice to have heard a recommendation. I thought I would start with what has certainly been Trent and my favourite. “How to Catch a Monster” by Christina Bollenbach. It really captured Trent’s imagination. Lukas is often scared by a monster at night, but decides to catch him by baking cookies, which of course are irresistible to monster taste buds. I tell you, the delight that literature has brought my little boys as portrayed on his face in this picture warms this book loving mother’s heart. 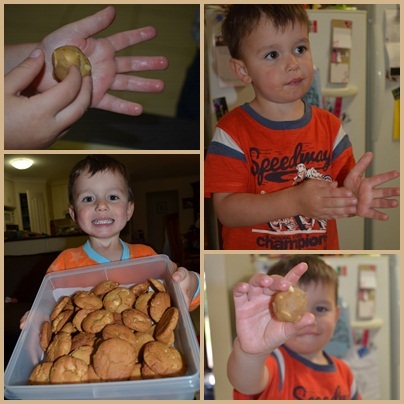 After seeing the entrapment, Trent was very insistent on baking his own batch of cookies. It hurts me to say that this is terminology he uses to refer to chocolate chip biscuits. This is the only drawback of the book. I have long insisted my children say ‘biscuits’ or ‘bikkies’. It’s the Australian (or British) way. Anyway, personal quibbles aside, the story is really lovely. Not only does Lukas catch the monster, but they also have a frank discussion about scare tactics and they end up being the best of buddies. And you know it’s good because the story remained in the mind of a three year old enough that in a totally different context, with quite a gap of time between reading the story, Trent has wanted to make biscuits like the boy in the book. We haven’t read the book for a little while, but today we made (white) chocolate chip cookies biscuits (there was the normal argument over semantics). This evening, I noticed that Trent had retrieved the book for his father to read him during bedtime stories. So. What do you say, biscuits or cookies? Scholastic gifted me the books, but did not pay for me to endorse their products. My opinions are my own.